Original the site of industrial workshops and old housing before these were demolished, it was turned into a garden with childrens playground and park benches, along with a shared community garden with different varieties of flora, and a pond for attracting wildlife while promoting biodiversity in the city. 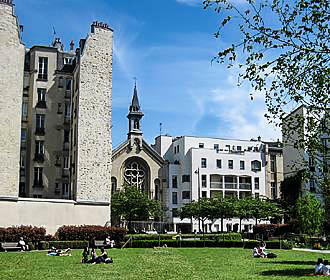 Originally, the area where you can now discover the Jardin de la Folie Titon was the site of old house and industrial workshops, yet these were eventually destroyed and the area of over 7500 metres squared became a wasteland, so the Mayor of the 11th Arrondissement along with the city of Paris decided to redevelop the area. The development program put in place, included creating new housing, business premises and a nursery, plus turn some of the area into a garden, which now covers an area over 4000 metres squared and was named after one of the old wallpaper factories that had once been located here. So you will find that the Jardin de la Folie Titon has a central lawn area, which is ideal for games or lounging around, plus there is a childrens playground to keep little ones happy, and even a small amphitheatre for impromptu music or dance. 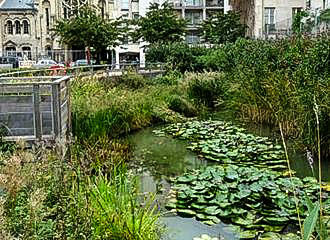 Yet one objective of the city of Paris, is to promote the idea of green spaces for relaxation and biodiversity, so with this in mind, a small ecological pond was put in place to promote wildlife and different plants such as water lilies. 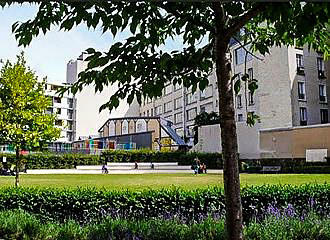 However, there is also another area to this garden in Paris, which is referred to as the Jardin Partage de la Folie Titon, which is basically a sared garden aspect designed with educational plots, and one of these is dedicated to disabled adults, as it is raised to allow gardening from a chair. Another plot is reserved for the school children at the school on the Rue Titon and another is run by an institute for disabled children, yet with other plots as well, there are a wide variety of different botanicals you can admire, which also provides much more diversity for wildlife such as butterflies, etc. You will find the Jardin de la Folie Titon located in the 11th Arrondissement and it is open from either 8am or 9am depending upon the day of the week, yet closing times vary depending upon the time of years from as early as 5.30pm in winter months to as late as 9.30pm in summer. There is access via the Rue de Chanzy and the Rue Titon and you may be pleased to know that this garden is accessible to the disabled, plus there are public toilets available including one which is wheelchair accessible, along with a water point for filling up water bottles and a WiFi zone. And when it comes to getting to the Jardin de la Folie Titon via public transport in Paris, you will find that the nearest Metro station is the Rue des Boulets stop serving line 9, yet there is also a Velib station for the self service bike rental scheme located close by.